We’ve catered many wedding meals over the years and we’re always proud to do so. Your wedding day is such a special occasion and you need to know you can trust the catering service that you go with, and when that’s Hog Roast Doune, you can be sure that you’re in great, capable hands. We have various menus available and we’re highly flexible, so you can mix and match items between menus if one of ours isn’t already perfect for you, and we even encourage you to devise your very own menu if preferred. The food served to you and your guests at your wedding reception should be all your own choice, whether you have a dream menu in mind for a formal affair, or a simple menu for an informal get-together, and we can certainly help you with either or anything else that you may have in mind. When Katie asked us to provide the food for a wedding, there would be two Doune venues for us to cater at – a private home, where 60 guests would be invited to enjoy a selection of homemade canapés, and then Rural Hall in North Lea, where the guests would have a sit-down meal and would feast on our Wedding Menu Option 2. While this menu offers two main courses that you can choose from, including spit-roasted pig, lamb, beef, chicken or turkey, barbecued burgers and sausages, Thai chicken kebabs and spare ribs or a vegetarian alternative, for this wedding we would be serving just the one meat – our famous hog roast. Our Hog Roast Doune team had a wonderful time preparing, cooking and serving our delicious food throughout the day at the two venues. 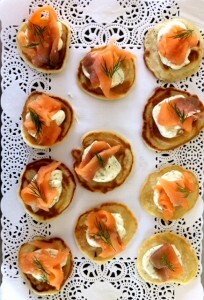 Our lovely canapés were well-received, as they tend to be, and we have a good selection on offer. The highlight of the food had to be our slowly-roasted hog, however, which we cooked for several hours and served together with our homemade apple sauce and stuffing, as well as fresh crackling. Once the tea and coffee had been served to the satisfied guests, Hog Roast Doune discreetly started to clear away to leave the happy couple and their guests to enjoy the rest of the special day.